Directions: Head south of Oregon on Highway 213. Take a right on S. Henrici Road. Swift was located at the corner of S. Henrici and S Reeder Road. *Update* Upon further examination of maps of the time, this location looks wrong. The coordinates are as reported by Lat-Long.com, but as you can see from the map, this location would be several miles northwest of what the Rail Road Map says it should be. I’m leaning towards the railroad map being correct, but this still leaves the exact location of the town and it’s surroundings a question. Swift was a small community located in Clackamas County south of Oregon City on what is now S. Henrici Road. The only data point I have for this town is that the Clackamas and Eastern Railroad was built to it in 1930. This connected the line to the Molalla Lumber Company Railroad. Looking in Google Maps and street view, it looks like a few historic buildings from that era may still exist. Shy Ann Meats and Sausage Company definitely inhabits an older historic building, and there is a barn on the corner of Henrici and Reeder Roads that looks many decades older then the house on the same property. If you know anything more about this town, or can confirm that the above two buildings were once part of it, please comment below! If you look at the above historical USGS map (You will need to extract it) and compare it with the C&E map, you can see that there where 2 old “communities” where Swift and Larkin were located. I am also inclined to believe the locations on this map as opposed to lat-long.com. Where Shy-Ann Meats is located there was a railroad line near there that ran from Oregon City to Mt Angel that passed through Molalla. That was the Willamette Valley Southern Railway Company. They crossed Henrici just east of Shy-Ann Meats and crossed through the campus of Clackamas Community College. Thank you Christian! That is an awesome map, and in my opinion pretty much settles the question. Was the building Shy-Ann Meats in, part of the railroad? It definitely has a bit of a train station/warehouse look to it. While I agree that the buildings have the look of having a railroad history, they are about .2 miles west of where the grade crossed Henrici. What i don’t know is the age of the buildings themselves. 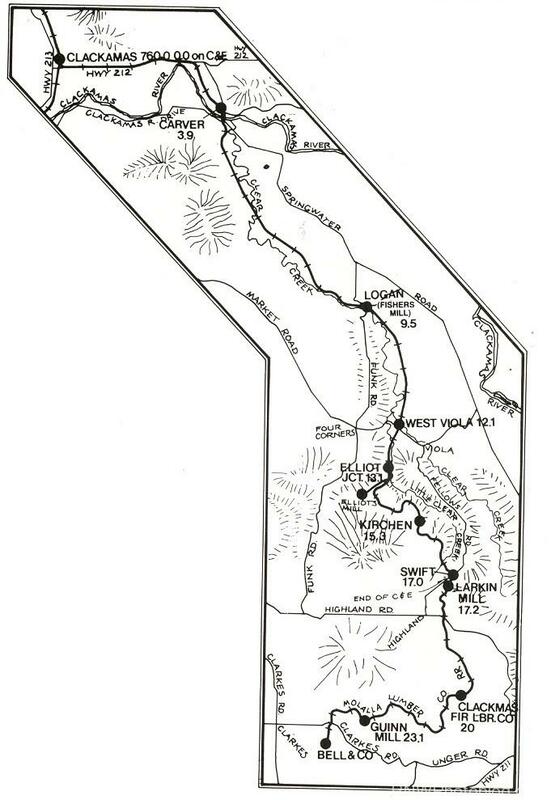 The 1914 USGS quad shows the railroad existing but the 1939 shows it as an abandoned grade. This link has a little more info. I know where Elliot mills and Elliot junction are. There is an old concrete structure there too.